I am a big fan of TMNT and I was quite thrilled when I saw a new Teenage Mutant Ninja Turtles game available for Android devices. Legends is probably the first “free” (okay freemium) TMNT game available on Google Play and it has impressive 3D graphics, lots of unlockable characters and a good turn-based tactical battle system. The red/green arrow shown above an enemy suggests the class disadvantage/advantage your selected character has over him. Tap on each enemy character to check for arrows. A red down arrow above an enemy suggests that your character’s class is weaker than enemy’s character’s class and that attacking him won’t decrease his HP much. Chances of a “Miss” are also more if you are attacking an enemy with a red down arrow. Moreover, when the same enemy hits your character, he may inflict more damage to him/her. A green arrow above an enemy suggests that your character has a class advantage over him and chances of inflicting extra damage to him are more. If the same enemy hits your character, then he would either miss or inflict less damage since his class is weaker than your character’s class. Confused? Well, you can manually check your character’s class advantage/disadvantage by noting down the background color of the enemy’s level (denoted by a number above the enemy) and the background color of your character’s level. Next, tap the gear icon at the top-right corner of the screen to pause the game. A new window will display class sequence showing class strengths and weaknesses. 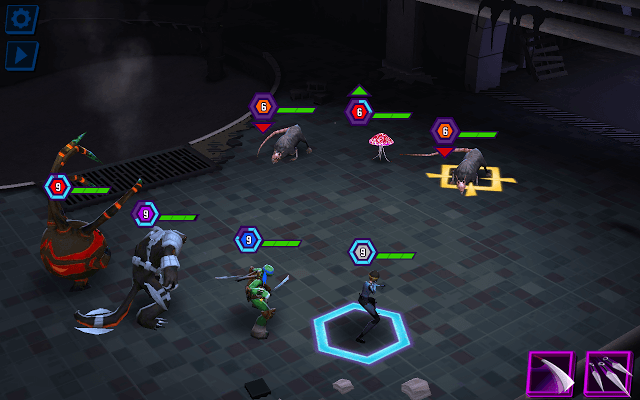 A TMNT character’s special skill lets you deal extra damage to enemies. Skills can be seen at the bottom-right corner of the screen. The first skill is the primary attack skill, followed by special skills. Some skills inflict damage to multiple foes whereas others can be used to target a single enemy. Try to use skill on an enemy whose class is weaker than your character to inflict max damage. Each character’s upgraded skill offers extra perks, such as reducing focus meter of the target enemy, damage over time for a certain number of turns, critical rate boost by a certain percentage etc. To upgrade your character’s skill, you will need to collect certain items. To check what items are needed for a skill upgrade, go to Roster and tap on the character portrait to access his/her “Skills” section. On the character screen, below “Find”, you will find the items required to upgrade a team member’s skill. Items missing from the required gear will be shown in red. To get those missing items, tap the icon. A new screen titled “Drops in the Following Locations” will show stages where you can find them. The screen will also show the card pack that may contain the required items. When you have collected the required items, you can upgrade your character’s skill. However, not all character skills can be upgraded instantly. You may have to wait for your character to reach a certain level before you can upgrade his/her skill. The free card pack may contain items that can be used for upgrading character skill. Skill upgrade gear can also be collected after completing a stage. Before attempting one, check the items that you may receive in the “Possible Loot” section. Once you have completed a stage, you can collect items. Try to get all three shurikens (stars) in a stage to increase the chances of getting all items from the possible loot section. You can replay old stages if you want more items. Each TMNT: Legends character card requires a certain number of “DNA” before you can unlock it and recruit him/her to your squad. 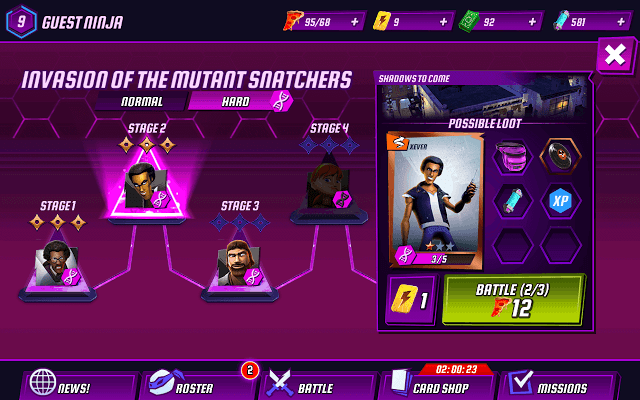 To get DNA, tap a locked character card under “Roster” and then tap the purple Find button. A new screen will show drop locations. These drop locations provide a list of stages of a chapter that need to be completed to get DNA and a card pack that may contain the DNA of a character. You will get 3 battle chances per stage on hard mode. Chances of acquiring DNA can be possible on first, second or third try, but sometimes, you may not get any and may have to wait for the next set of battle chances to grind for DNA. Try to beat a stage achieving all three shurikens to increase the chances of getting DNA. Once 3 battle chances are over, there’s a cool-down time that prohibits players from playing that stage for a few minutes. You can again grind for DNA and get three more battle chances once the cool-down time is over. The Free card at the Card Shop may also provide DNA of a random character. You may also get DNA of a random character after reaching a new player level. You will have to replay old levels to get items for character skill upgrades. You may also have to replay old levels in hard mode to get DNA. Playing the same level over and over again to grind for DNA and loot can be boring, which is why the game lets you use warp passes to instantly complete stages with 3 stars and instant rewards. 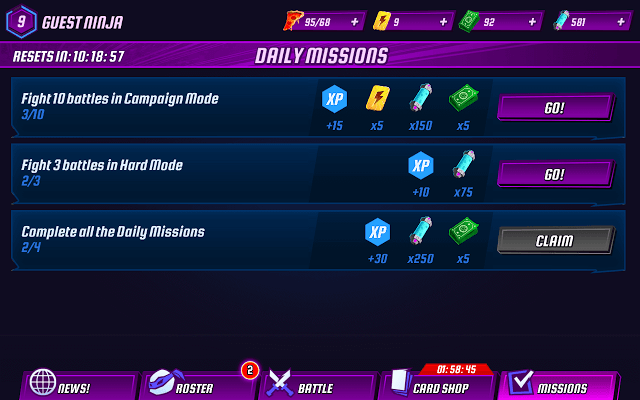 You may get warp passes after reaching a new player level and by completing “Daily Missions”. Tap the mission tab to check for tasks that will get you passes. Warp Passes are not easy to earn, so why not make use of the auto-play button to let your squad battle enemies on their own. Just make sure you have upgraded all squad members to their max level before auto-playing old stages. The auto-play button is located at the top-left corner of the battle screen. Using auto-play is the best way to speed up battles. To unlock a skill of a squad member, you will need to reach a new rank or star. To get a new star for a squad member, you will have to collect the required number of DNA shown at the bottom of a character’s card. Tap the “Find” button on the character card to locate stages that will provide DNA. These stages must have hard mode unlocked and only then you can grind for DNA. Read Tip No. 4 to get more information on how to get DNA.